2013 marks the 30th anniversary of the novel’s original publication in Russian. From the opening page of “Pushkin Hills,” Sergei Dovlatov’s witty observations and descriptive brilliance are a delight. Readers first meet Boris, an alcoholic, unpublished author, on his way to work as a tour guide in the old family estates of the poet Alexander Pushkin. 2013 is the 30th anniversary of the novel’s original publication in New York. “Pushkin Hills” is rich in bittersweet comedy, including rural encounters (“From Leningrad.” “Ah, yeah, I heard of it...”) and questions from tourists: “What was the duel between Pushkin and Lermontov about?” He observes that pictures of famous people like to emphasize one large feature: Marx’s beard, Lenin’s forehead or Pushkin’s sideburns. Dovlatov was born in 1941; his mother was an Armenian actress-turned-proofreader and his father a Jewish theater director. He grew up in Leningrad, studied Finnish and worked as a prison guard before he became a journalist. The Journalists’ Union expelled him for secretly publishing his early stories abroad, the KGB destroyed the letterpresses for his first book, and in 1978 he emigrated, following his family to New York the following year. 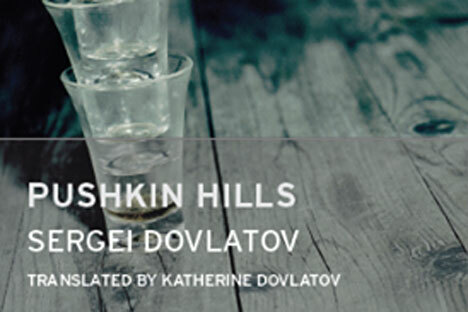 Dovlatov died in New York in 1990, but in the intervening decade he published what would become some of the best-loved Russian novels of the late twentieth century. Celebrated only posthumously in Russia, Dovlatov himself fits the pattern. The log cabin where he lived in Pushkin Hills has been recently converted into a museum. He describes this cabin in the novel, with its un-curtained windows, holes in the roof and gaps between the floorboards where stray dogs get in.